The 49ers elevated Dunbar to the 49ers active roster Wednesday. 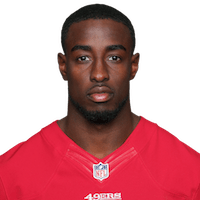 Analysis: The Niners will be without Dante Pettis (knee) in the season finale, and Marquise Goodwin is dealing with a calf injury, so Dunbar provides depth at wide receiver. If Goodwin is unable to play, Dunbar, an undrafted rookie, will serve as the No. 4 wideout in his first NFL game. There are no videos available for Steven Dunbar. Click here to view all videos.